Soothing preparation Aquastop® Radiotherapy is recommended for use during and after radiology treatment. Limits skin damages which occured in result of radiology treatment, such as: dryness, redness, itching, chafing and cracking. 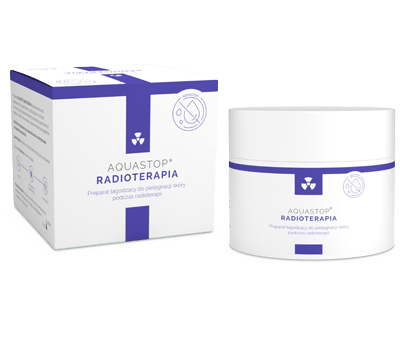 Aquastop® Radiotherapy shows soothing, emolliating and protecting effects for irradiated skin. Substantially improves tolerance of post-radiation reactions on skin and therefore improves patients’ comfort. Does not contain water, fragrances, colourants or parabens. Caution: do not use if allergic to any of the ingredients. Directions for use: apply topically to the affected areas of the skin, see the leaflet before use.